When it comes to lipstick, I become incredibly paranoid that I’ll have smudged it all around my face, get chunks on my teeth or even wipe it down my arm, the possibilities are endless when you’re naturally clumsy and messy in equal parts. However, I have not let that stop me from building up a small but perfectly formed collection of essentials in my kit. 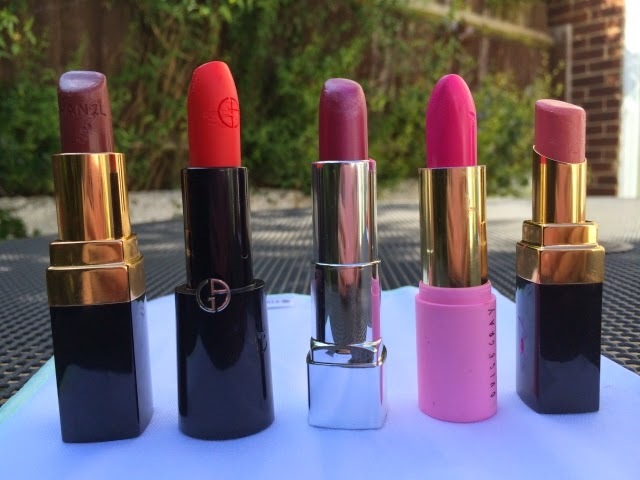 Theses trusty five are the lipsticks I lean towards when I need a pop of colour, an instant pick-me-up or just need a little smile to myself. The first high-end lipstick I bought myself was from the glossy Chanel counter. I was drawn in by the sheer extravagance of it all. I remember swatching a few of the brightest reds they had from the Rouge Coco collection and immediately falling for Rouge Orage, no 23, which for me is the perfect balance between bright red and deep plum. I fell hook, line and sinker and became obsessed with the velvety feel and the pigmentation of the colour. I couldn’t stop at one, next up came Venise, shown above. This is a gorgeous deep red with a hint of plum. It looks slightly gothic against my pale skin and works best when I wear little eye makeup. What can I say, I’m a sucker for Chanel. Which is why, when I needed a pretty, shimmery pink, I went straight to them and grabbed Rouge Coco Shine in Adventure. As for the others, they all work for different occasions. I find the Giorgio Armani Ferarri red goes with everything and can really transform my complexion, ramping it up a notch. Let’s face it, who doesn’t like a bold lip? The purple-toned Rimmel lippy was purchased for my besties wedding last March as I fancied something a little different and, as for the blindingly-bright pink, well, I couldn’t say no. FYI, I’ve just found it in the sale for £1. You’d be silly to miss out. Get it here. While we’re here I feel I should confess to my new lip addiction. Rimmel’s Colour Rush lip crayons. They’re so good, I’ve gone and bought three of them…. So far. There’s no stopping me at the moment. You can tell from the way the crayon’s worn down on the two at either end just how often I’ve been using them. From L-R; 600 On Fire, 120 All You Need is Pink and 220 Rumour Has it. I would say they’re so easy to use I can apply them without a mirror but to be honest, I’m just not that steady handed, especially on the train in the mornings. What’s your go-to lippy colour? Previous Post Who Wouldn’t Want A Sombrero-Wearing Chihuahua on a Jumper?